If you like cake, you'll love cake POPs! These delicious little treats that are a cross between a cake and a lollipop. Now you can make your own with this gorgeous kit. 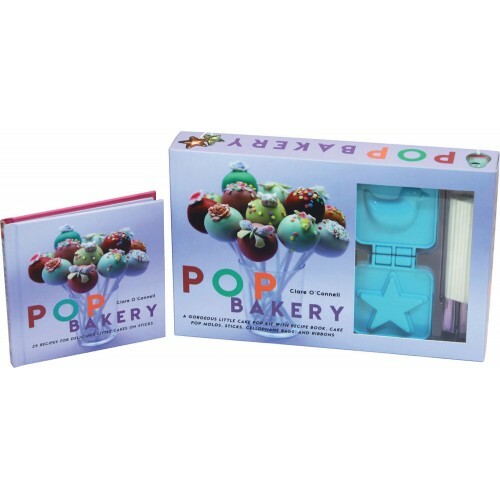 Clare O'Connell of the POP Bakery teaches you all you need to know, from how to create the cake balls - a mouth-watering mixture of chocolate cake and icing - to dipping the cake balls in the special candy coating. Then she explains how to shape the POPs and paint them using cocoa butter. Choose from 25 delightful designs, including cute pandas, frogs, penguins, plus a family of Russian dolls, mini wedding cakes and colourful marbles. With clear, step-by-step photography and Clare's easy-to-follow instructions, cake POPs are incredibly fun and easy to bake and make. Both children and adults will adore these bitesize delights that are perfect for parties and special occasions. So what are you waiting for? Start cake POPping now!